These letters were written by Sarah Cornelia Alden (1841-1888) to Capt. 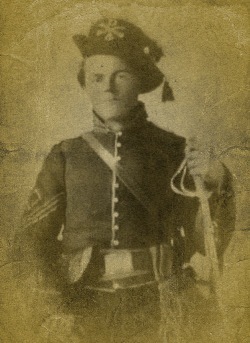 Lot Abraham while he served in Co. D, 4th Iowa Cavalry during the American Civil War. Though I have transcribed thousands of letters, I found this collection of letters to be extraordinarily remarkable. Why? For a number of reasons.”Neal” — as she preferred to be called — the author of these letters — came from a family with limited resources. Her father, a stone-cutter, died when she was less than ten years old. When her mother married her widowed uncle and began another family, Neal learned to fend for herself by her own industry which included teaching school to other Iowa children. Her strong faith gave her courage to overcome life’s obstacles and her patriotism in the darkest hours of the national calamity which pitted brother against brother on the battlefield, and neighbor against neighbor on the home front, was incredible. Her constant voice of encouragement and expressions of hope written to her friend (and eventual fiancé) during their nearly four years of separation must have been an incalculable inspiration to him. There are 50 letters in this digital, virtual collection. Twenty-three of them were written in 1863, nine in 1864, and eighteen in 1865. It is rare to discover so many letters that found their way to a cavalryman in the field and even more rare that they were preserved. It seems clear that a large number of Neal’s letters either did not find her soldier or were lost after being read before or after he returned home. No letters have been found for the latter half of 1864 when Capt. 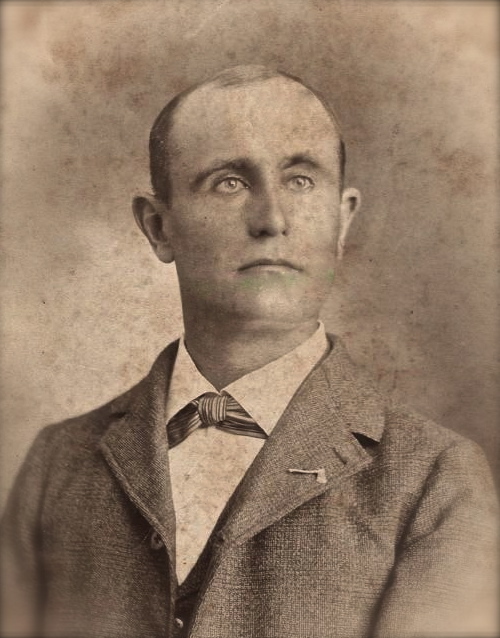 Abraham rode with the 4th Iowa Cavalry through Alabama and Georgia on an extended campaign. To enable the reader to gain a better understanding of Capt. 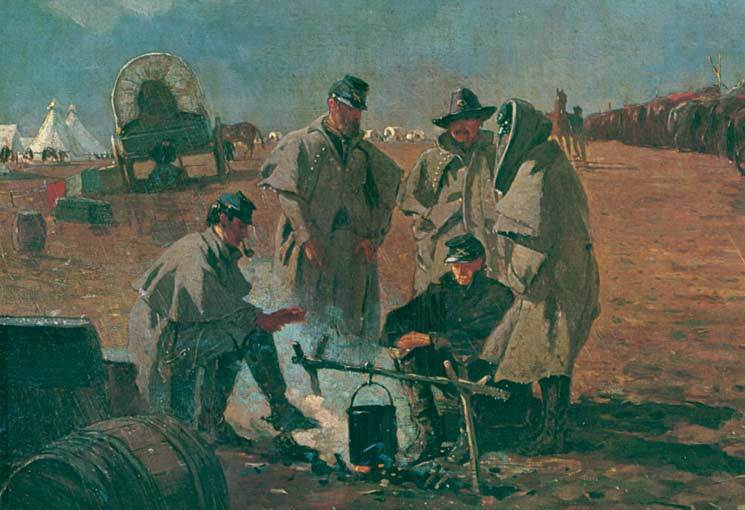 Abraham’s service in the 4th Iowa Cavalry, I have provided links to the diaries he kept from 1859 through 1865 — all of which are now housed in the archives at the University of Iowa in Iowa City. The 1863 and 1864 diaries can also be viewed in their digitized form on the University’s website. The diary that Lot kept from 1859 to 1862 was sold on the internet in 2013 and I purchased it, transcribed it, and posted in on this blog before donating it to the University of Iowa. Lot’s 1865 diary, kept while he participated on Wilson’s Raid through Alabama and Georgia, has just recently (2015) been digitized by the University of Iowa and I have added my transcript of it here as well. I have also provided footnotes and endnotes for each letter and included links to pages I created for both the Abraham and Alden families. Two of Lot’s Relatives from Mt. Pleasant, Iowa? This carte de visit was found in Lot Abraham’s 1859-1862 Diary. The identity of the two women remains a mystery. 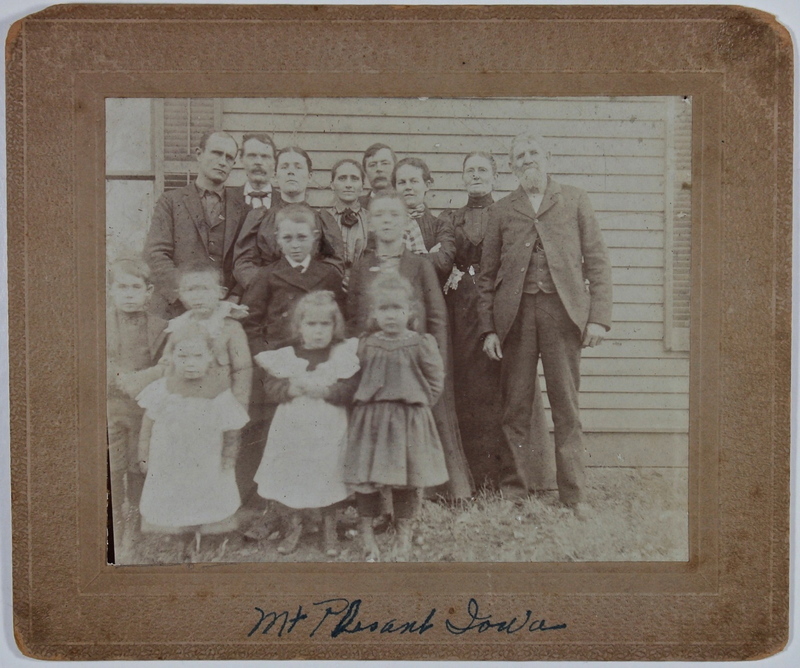 Their faces do not appear to match any of the women in the Abraham Family photograph that also appears on this blogsite. I was hoping that there might be some entry in Lot’s diary that might confirm their identity but I was disappointed. The reverse side of this carte de visit is stamped “Leisenring Bros. Photographers, Mt. Pleasant, Iowa.” The history of this gallery in Mt. Pleasant reveals that William Leisenring opened a daguerreian studio in Mt. Pleasant as early as 1855. By 1859, William’s son, James B. Leisenring, had joined his father and the firm became known as the “Leisenring and Son” daguerreian gallery. It was located at the southwest corner of the Public Square over Buhelman and Wise’s clothing store. After William’s death in May 1860, James continued as operator of the gallery and relocated it to the State Bank Building opposite the Brazelton House. In May 1863, James’ brother William joined the firm and it operated under the name of “Leisenring Brothers.” From this, I conclude that this carte-de-visit was taken no earlier than the summer of 1863 and probably in 1864. 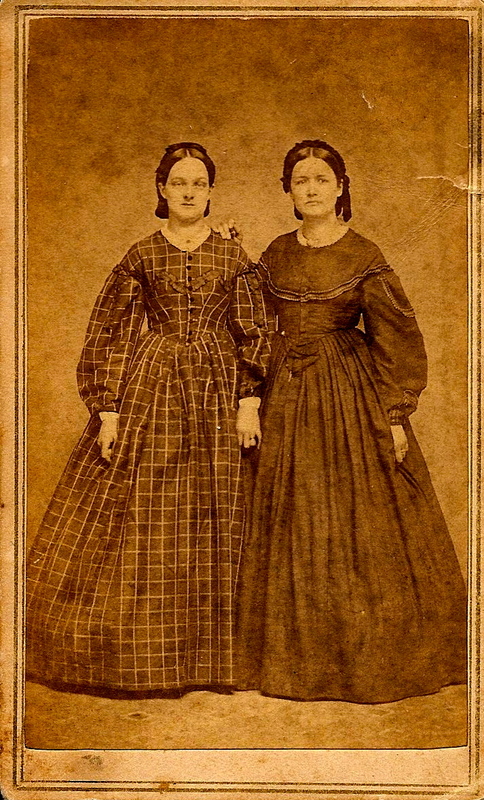 Given the close friendship between Lot’s sister, Margaret “Mag” Abraham and Sarah Cornelia Alden, it may be that they are the two women in the photograph. They might also be two of Lot’s sisters. Lot Abraham (1838-1920), second from left in back. Sarah Cornelia (Alden) Abraham, fourth adult from left. John McCue Abraham (1840-1913), back row center. William Howard Waugh (1866-1954) far left. Sara Cornelia (Abraham) Waugh (1869-1943), third adult from left. William Howard Waugh (1866-1954) was the husband of Sarah Cornelia “Sally” Abraham (1869-1943). Sally was the oldest daughter of Lot and Neal Abraham.